Today I want to focus on the boat. I start with a nice mixture of French Ultramarine Blue and Burnt Sienna to create a lovely dark neutral color. I first apply it at a value of about 5 (six would be the darkest value, so 5 is dark but still transparent) on the back, shadowy area of the boat. 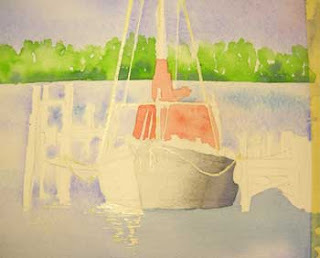 As I work the wash forward I gradually add more water until I am just painting with clear water at the front of the boat. This is called a graded wash and you can see the lovely transition from dark to light. The only crisp lines are where the wet pigment was applied to the dry paper and not softened by a damp or wet edge. I am always amazed at how this simple little wash can accomplish so much. Be sure when developing this area that you do not brush more than once in each area. Apply a stroke of paint, tip your board so that a bead of wet pigment crawls to the edge in the direction where you will apply your next stroke. Dip into your paint, then just barely touch the bead as you pull the next stroke of paint along. Continue this process, adding more water to your paint each time, until you are just painting the stroke with water. If you don’t touch your brush more than once to the area, you will have a beautiful, clean transition from dark to light. This really shows the dimensionality of the boat! Now, using Winsor Red, a great, transparent tomato red, I applied a little wash to the sail covers. I varied the value (lightness and darkness) of the pigments so this underpainting will have some depth to it. We’ll add details and shadows in another step. Allow this to dry thoroughly, or dry it with a dryer at a cool setting.